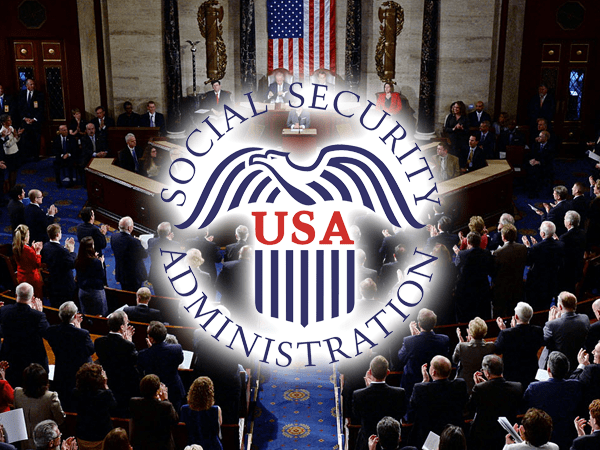 Congress just announced plans to deal with the ever-growing Social Security dilemma in hopes that these three new strategies will keep the system solvent. However, it’s plain to see that they’re passing the buck instead of actually solving the problem. And the more they pass the buck, the more taxpayers, retirees, and investors are going to suffer. Experts predict there will be more people taking money out of Social Security than people paying into it as soon as 2021. 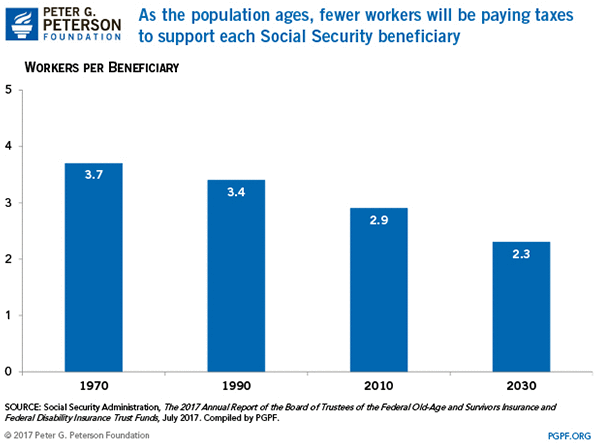 According to the Peter G. Peterson Foundation, a think tank which focuses on fiscal matters, this extra strain on Social Security means in 2034 recipients could see their payouts cut by 23%. This would shrink recipients’ payments down to a shocking $5,969 a year in today’s dollars. That’s less than $500 a month. Reduced benefits mean rough times are ahead for the 60% or so of retired Americans who rely on Social Security alone to make ends meet. With just 3 years to go before Social Security is deep in the red, there’s no time to be complacent. In 1970, there were four workers for every retiree collecting Social Security benefits. But the country’s demographics have changed since then. This is putting increasing pressure on the Social Security system, and experts predict it will continue to do so until around 2029. However, the problem isn’t just more people are retiring, they’re living longer too. The average life expectancy in the U.S. keeps rising, and the average retiree will now live to a ripe old age of 78.8 years. Because of the change in the country’s demographic makeup, there’ll be only two workers for every retiree by 2034. With fewer workers contributing to the system, less cash will be collected to support more people who are receiving benefits for longer. Something’s got to give, and as the following graph shows, too much pressure will be placed on workers in the coming years. This dire situation is worse news for those who are most vulnerable, as the Social Security Disability Insurance Trust Fund is expected to run out of funds by 2028 – meaning an estimated 11 million disabled Americans could face benefit cuts of about 7%. Bottom line: Somebody is going to get screwed. Will it be retirees collecting Social Security benefits? Will it be the workers paying for these benefits? Chances are, it’ll be both. To “solve” this massive problem, Congress is proposing three drastic measures. But the fact that they’re proposing them shows they don’t know how to handle the situation. First, they want to raise the age of retirement. 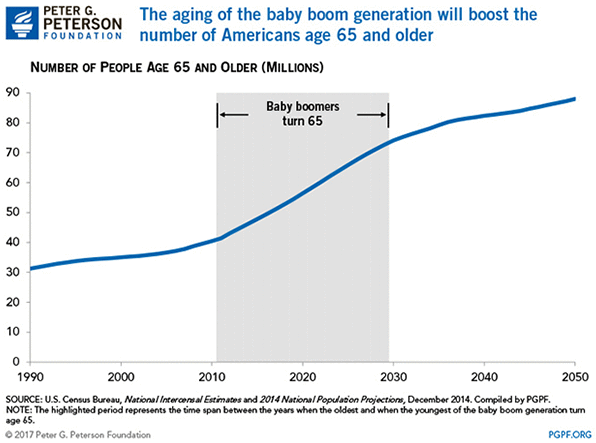 Currently, Baby Boomers born between 1943 to 1954 can look forward to retiring and getting their pensions at age 66, with those born afterwards at 67. With more retirees living longer, Congress knows this isn’t practical. In an attempt to slow down the flow of retirees, another suggested proposal is to raise retirement age by one month per year. So people born in one year would be able to retire at age 67 and one month, and the year after that age 67 and two months, and so on. The second idea proposed is to raise the payments being made to the Social Security program. At the moment, taxpayers are contributing 6.2% of their entire income up to $127,200 (plus another 6.2% paid by employers) into the social security system. Trustees are hoping that raising this by 2.83% could keep things afloat. And finally, they’re considering either raising or getting rid of the cap on taxable wages. This would only apply to those making more than $127,200 a year. If Congress follows through with these measures, everyone is going to pay the consequences. Changes to the tax cap could close roughly a quarter to nearly nine-tenths of Social Security’s solvency gap, depending on how they were structured. A Catalyst for a Stock Market Collapse? Despite their words of optimism, if Social Security benefits are cut significantly, future Social Security recipients will be hit hard. Add to this the fact that only around one in eight Americans have a pension, and nearly half of all families have no retirement saving, millions of Americans will have a bleak future to look forward to. Retirees will be left with no choice but to draw down 401(k) and IRA accounts faster than planned. This accelerated selling pressure could drive the stock market down fast, and be the trigger that collapses the market. With such a bleak future just around the corner, Americans need to start making the move to protect their retirement. Precious metals like physical gold can be one of the most reliable ways to hedge against lower stock prices and reduced Social Security benefits. So if you’re serious about protecting your wealth, now would be the time to make the move to precious metals.